We all got to make this at the last shoebox swap. This is Mena's design using this pretty flower stamp, love the colors together. Cutting out the flower and stem adds terrfic dimension to the card. Fabulous Florets is not a new stampset but it sure is pretty. This popup card was designed by Lily as a one of her shoebox projects for everyone to make. It will lay flat for mailing, love that! I made another fancy favor bag using shades of brown for Christmas. The DSP is Candlelight Christmas Specialty and I love the Early Espresso along side the traditional red and green. 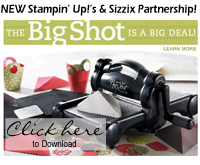 Check out the Snow flurry Bigz die and the champagne glitter paper. There is so much cool new stuff in the Holiday not-so-Mini that you really need to look close or you will miss something! Here I used Toxic Treats again and layered with the new framelit Window Frames Collection. What did we ever do without these framelits. The ribbon is really not ribbon at all but the new Scalloped Tulle. It comes in three colors, this one is Crumb Cake. I love tulle and have used it like garland on my fancy Christmas Tree for years. It adds some interesting texture. Also, the base of the card is not the part that opens. 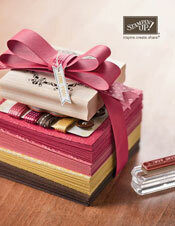 The vanilla is layered on top of the black cardstock for a little twist. This card is one of my favorites. While we were in Hilton Head, I did a little stamping. Can you believe I took a LARGE plastic container of supplies AND my Big Shot :) We drove, so not an issue with space. This is a simple goodie bag made from the Fancy Favor die. The scallops at the top are cut from Tasteful Trim and the stamp set is Toxic Treats. Must be fun to name the stamp sets. Time to get back into the groove of stamping...returning from vacation and the holidays will be here before you know it. I love Halloween so I am going to share some of these projects with you first. The kitty is from Frightening Feline and the fun DSP is Howlstooth and Scaringbone. Fun name, huh! The cat is embossed with Tangerine Tango EP and did you notice the paper piercing around the Apothecary die cut. The top of the card is trimmed so the sentiment is on the bottom of the inside. Do you like it?